Here at Campbell Scientific, we are excited about our most recent measurement advance—a new interface module that promises to significantly improve vibrating -wire measurements. Vibrating-wire technology is used in many sensors, including strain gauges, pressure transducers, piezometers, tiltmeters, crack meters, and load cells. These sensors benefit a wide variety of structural, hydrological, and geotechnical applications because of their stability, accuracy, and durability. While vibrating-wire sensors have their benefits, they suffer from one major problem—external noise. Because measuring these sensors involves low-level, audio-band signals, external electromagnetic noise can interfere and make it difficult to determine the resonant frequency of the sensor. If the external noise is bad enough, it can render data useless. The new AVW200 interface module applies a new method for measuring the sensor’s frequency. The traditional method uses a time-domain approach. The natural or resonant frequency at which the wire is oscillating is determined by exciting the wire with an AC excitation, stopping the excitation, and then measuring time between response pulses. In addition to refining the AC excitation, the new method featured in the AVW200 takes advantage of a built-in spectrum analyzer that uses spectral interpolation instead of the traditional pulse-timing approach. It samples the returned signal, performs an FFT (fast Fourier transform) to discriminate between spectral components, and then identifies and measures the resonant frequency of the sensor. This means that even in noisy environments the sensor’s resonant frequency can be identified and accurately measured. Along with improved noise immunity, the new method provides other important benefits. It provides much better measurement resolution (improving from 0.01 Hz to 0.001 Hz) as well as diagnostic information about the measured frequency. This diagnostic information includes the signal-to-noise ratio, amplitude of the dominant frequency, and an optional spectrum showing all of the frequency components. The AVW200 can be used via SDI-12, RS-232, or PakBus network protocol. Its low power consumption and rugged design match the durability and long-term stability of vibrating-wire sensors. Wireless versions are also available, allowing for remote deployment separate from the datalogger. We expect the AVW200 to build on our reputation for providing quality measurement products for both research and day-to-day applications. 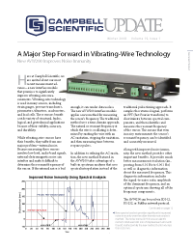 For more information, please visit campbellsci.com/vibrating-wire.